Oil and gas exploration has begun at Horse Hill Road, off Reigate Road. We are now in the early stages in the UK of “unconventional” or “tight” oil exploration, utilising hydraulic fracturing (“fracking”) to free up formerly inaccessible oil and gas reserves. As global “conventional” oil reserves dwindle, the fossil fuel industry is desperately promoting fracking as a way of continuing business as usual, heavily promoted and subsidised by our Government. A recent analysis by the IMF estimates the UK “will spend about £26 billion on subsidies for fossil fuels this year”. By contrast, renewable energy companies received only £3.5 billion of subsidies in 2015-15, and Government has decided to slash this amount by ending support for onshore wind farms and cutting solar power subsidies. 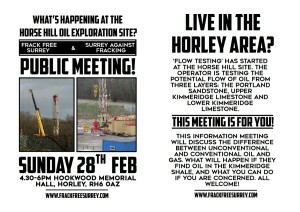 Local residents are invited to a meeting tonight at Hookwood Memorial Hall to find out more about what’s happening at the oil site on Horse Hill. ‘Flow testing’ has begun and we’re in the early stages of an ‘unconventional’ or ‘tight’ oil exploration, using novel methods to free up formerly inaccessible reserves. As ‘conventional’ reserves dwindle, the fossil fuel industry is promoting more extreme methods of continuing business as usual, heavily promoted and subsidised by our Government. The meeting is at Hookwood Memorial Hall, Withy Meadow, Horley RH6 0AZ, from 4.30pm to 6pm, this Sunday 28 February. Refreshments available. Come along to find out more about the differences between conventional and unconventional oil, and what are the likely next steps at Horse Hill and in the wider area. Representatives of the Protectors Camp will be there to talk about what they are doing and why. There will be some short presentations and lots of time to ask questions and chat with neighbours and others over tea and cake. Parking is limited, so please walk if you can. 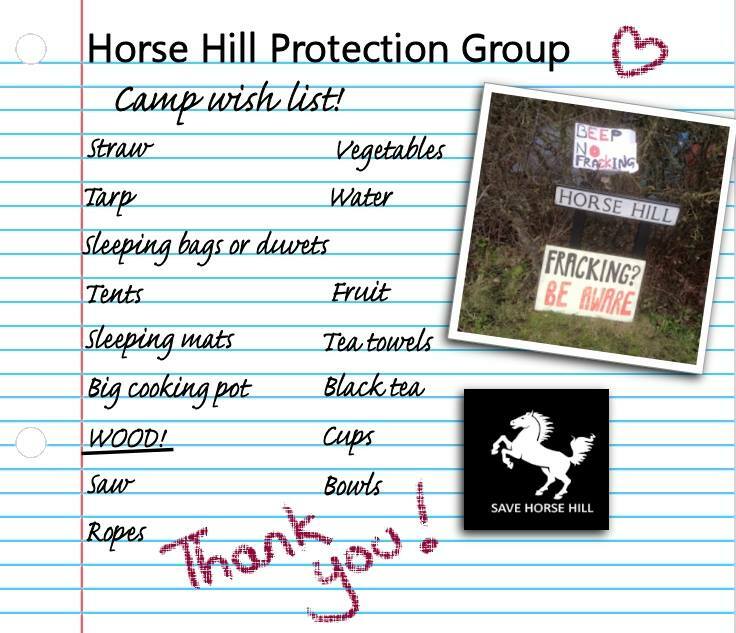 Thank you to everyone who came to our Horse Hill solidarity events on 20 February. And thanks to Matty Evo for the photos. 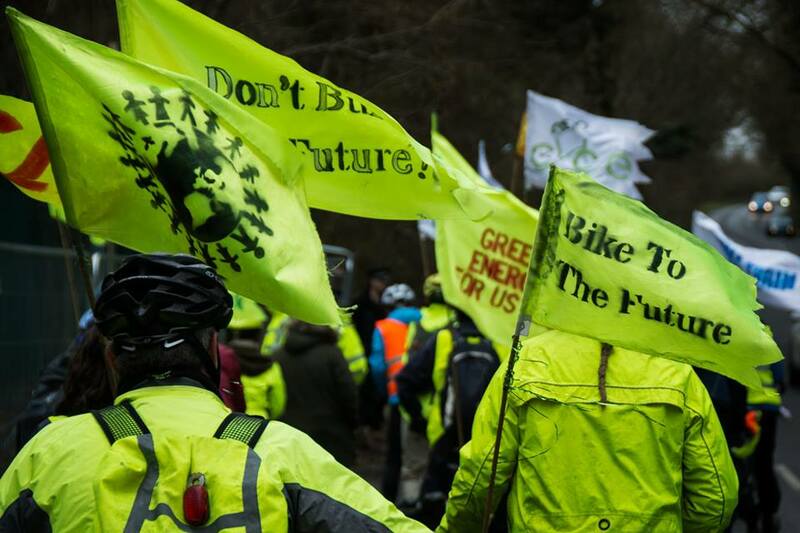 Some 40 cyclists rode from Brighton, London and Horley, and were joined by around 100 people to walk to the Horse Hill drill site, with the message ‘Keep it in the ground‘. 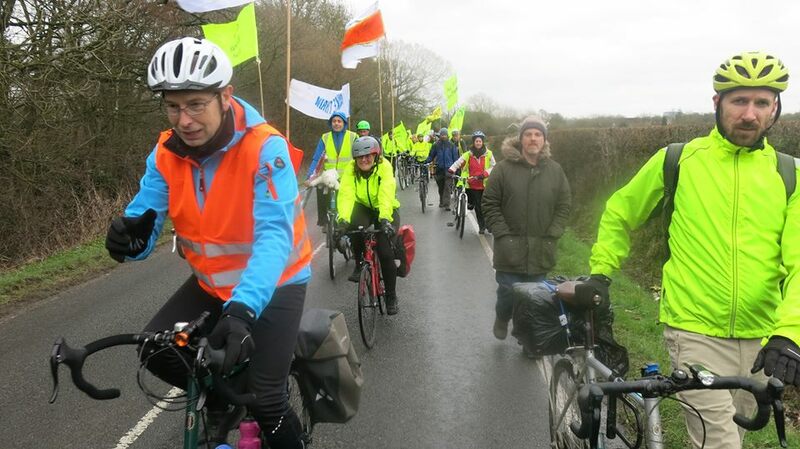 Keith Taylor, Green MEP for South East England, has sent a message of support to those gathering at Horse Hill today for the solidarity walk and cycle ride. “My apologies that I can’t join you in Horley today, but I’d like to thank you all for being here to stand up for our communities and our environment. “The reported discovery of large quantities of oil at Horse Hill has been the source of significant concern to those living in the area and further afield. 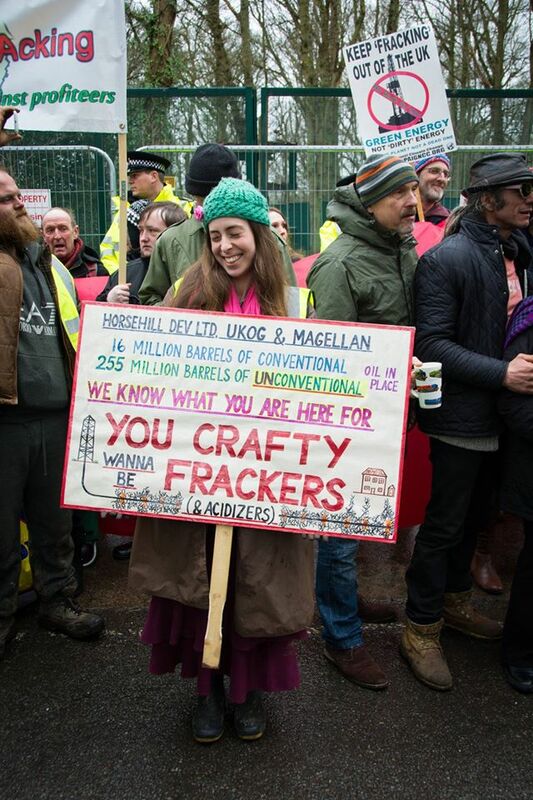 These concerns are justified – not least because UKOG have not given sufficient assurances that they will not use unconventional techniques to extract the oil. “The scientific consensus on climate change has never been greater and we have been told that the only way we have a chance of averting catastrophe is by leaving large reserves of oil in the ground. “If the UK Government is to meet its climate change targets set under EU law and commitments made only recently at climate talks in Paris, we must shift our focus to renewables and leave these fossil fuels in the ground. “The UK has enormous renewable energy potential – and we have seen evidence that people in Surrey and across the South East have the passion, willingness and know-how to create clean, people-powered energy in spite of the Government’s onslaught. 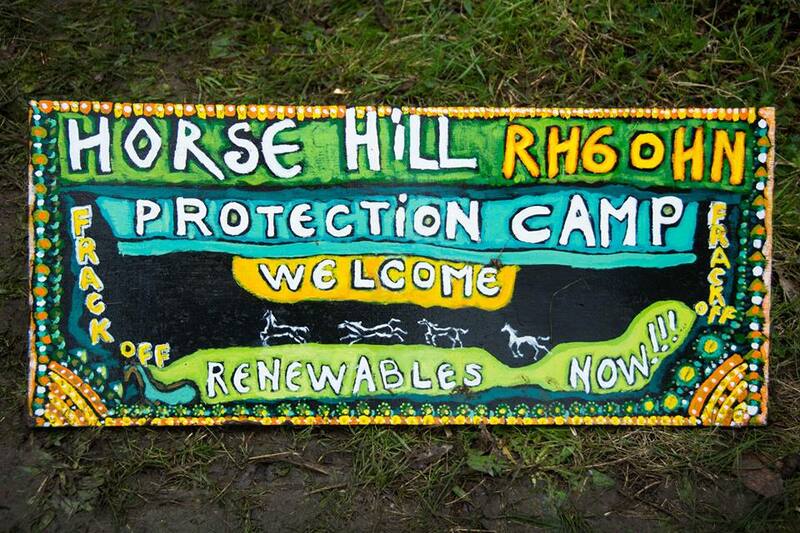 “The extraction of oil at Horse Hill not only risks damaging our local environment and health, it is a distraction from the work that must be done to build a sustainable future based on a clean, democratic energy system. 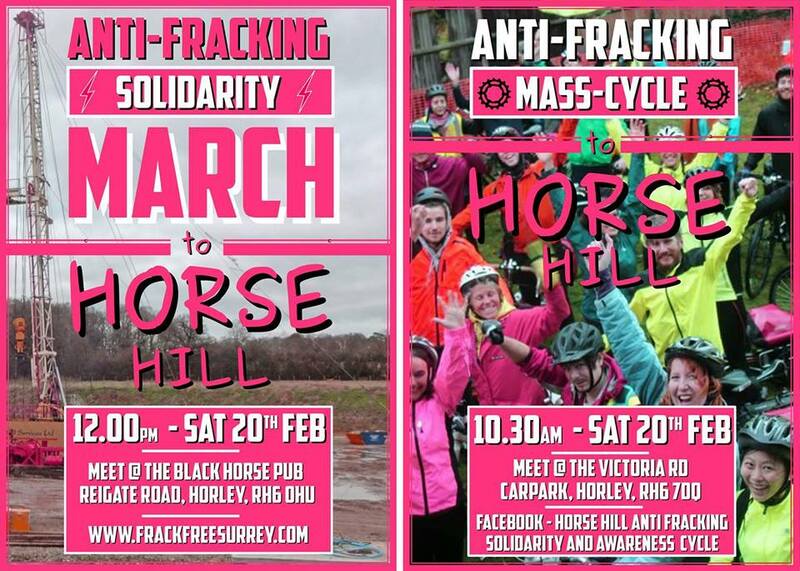 Come and join in a Solidarity March or Cycle Ride to the Horse Hill drilling site, on 20 February. 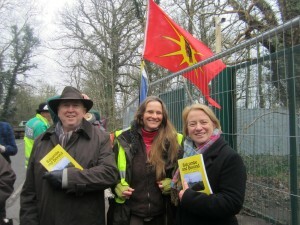 Green Party Leader Natalie Bennett and South East MEP Keith Taylor visited the Horse Hill drill site in Surrey, to show their support for the local community and their opposition to new fossil fuel exploration. Natalie Bennett said, “I came here to support the protection camp. It’s clear that it’s growing fast and winning local support. “And this isn’t just a local issue – it’s an issue about our climate. 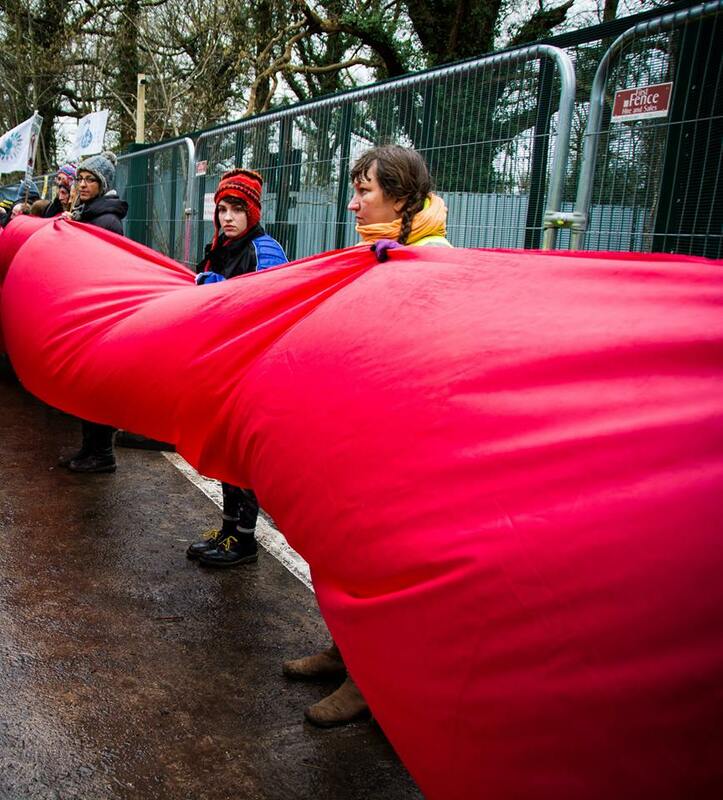 Press release from the No Fracking in Balcombe Society (NO FIBS), Monday 8 February 2016. 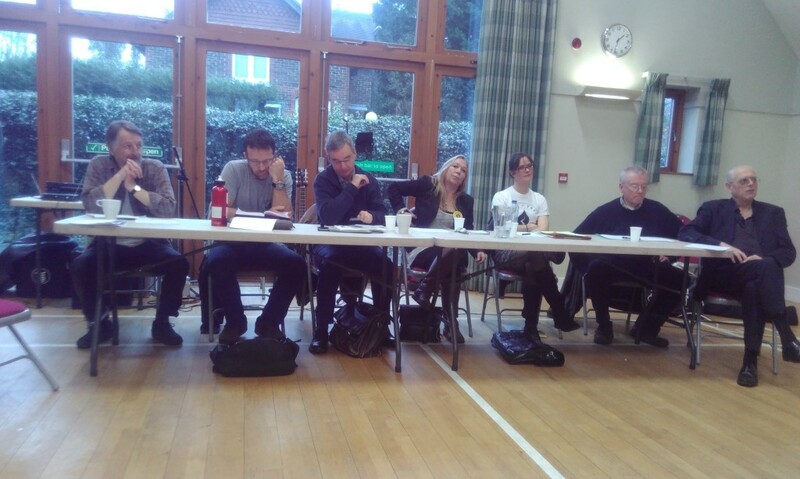 Surrey Against Fracking organised a packed meeting at the Oxted Community Hall on Saturday 6th February to spread awareness of the dangers surrounding drilling for unconventional oil and gas, including fracking. This was the end of the week in which equipment and chemicals entered the site at Horse Hill near Horley in preparation for flow-testing the oil well drilled there last year. Amongst the speakers in Oxted were John Ashton, who worked as a diplomat for over 20 years, and latterly as the UK’s Special Representative for Climate Change, and Dr Damien Short, a social scientist from the University of London specialising in human rights. The audience also heard from members of other communities threatened by fracking or other unconventional means of extracting oil and gas: Helen Savage and Charles Metcalfe from Balcombe in Sussex, and Tina Louise Rothery from Blackpool in Lancashire. 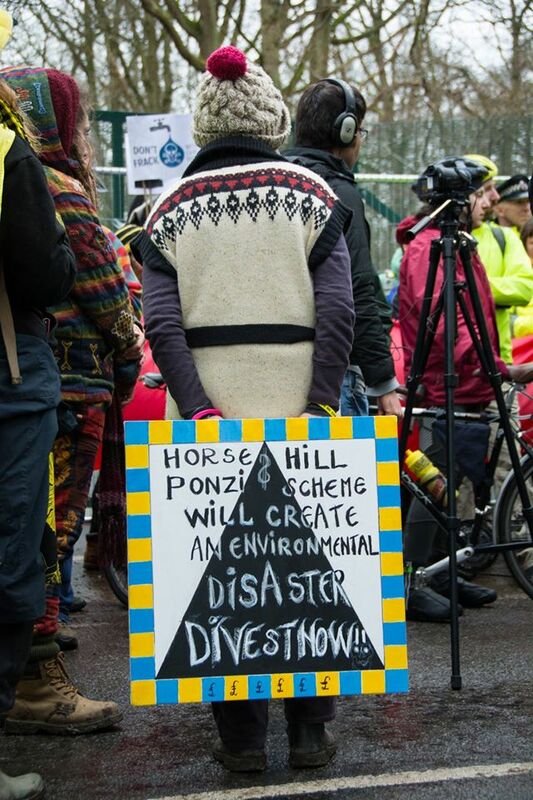 With Surrey in the spotlight thanks to flow testing at Horse Hill, campaigners gathered in Oxted at a meeting organised by Surrey Against Fracking to raise awareness of the threats posed by unconventional oil and gas. Among the group were people who have been at Horse Hill over the past week. See the end of this article for how you can support them. A stellar line-up of inspiring speakers addressed the meeting; the speeches were interspersed with short films and followed by discussion, music and refreshments. The speakers covered a wide range of topics, the following are just some key points, and quotes may not be verbatim. The keynote speaker was John Ashton, former Special Representative for Climate Change and now a respected speaker on politics and climate change.